Printed by Ernest Meyer, Paris, France. † Both Scott and Gibbons identify colour variants in the first issue. We are grateful for the contribution to our knowledge by Michael Kielb. Most of the information presented here is due to his efforts in collecting it. 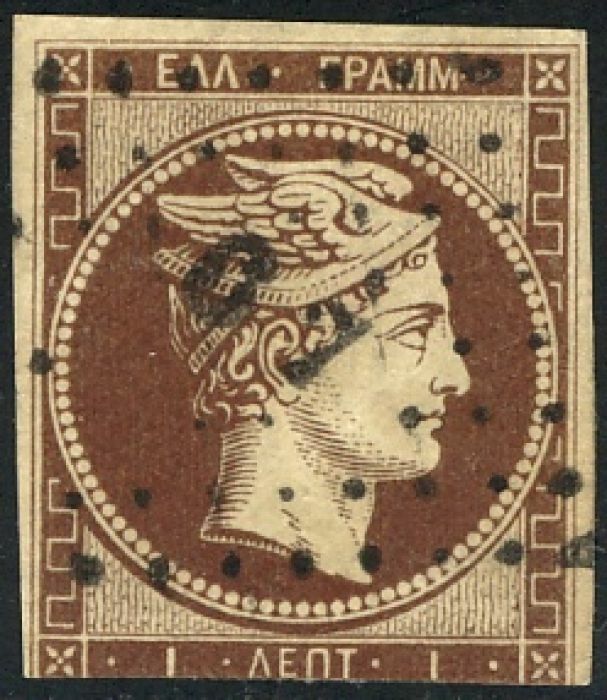 All "large Hermes heads", as these stamps are generally called, were printed from the same plates. Therefore, the whole run from 1861 to 1883 (Scott #1 to 58) is really one issue, with a series of different printings. Catalogs treat them as different issues out of convenience, but this is perhaps erroneous. The different values were produced by simply substituting the small value table in the lower left and right of the die. The stamps were printed in sheets consisting of two panes of 150 stamps, 15 rows of 10 stamps each. The first printing, Scott #1 - 7, was done in Paris, France. It is called the "fine" printing, since the print quality is somewhat better than the following printings done in Athens, Greece. Stamps printed in Greece were first of a lesser quality, the so-called "coarse" printing. It was followed by an improved print quality, perhaps more "careful", in December 1861, and finally the "consecutive" printings, starting in early 1862. A total of eight printings were made in Greece. Numerous different color shades and paper colors were used in the 25 years these stamps were in use. Combine that with the presence or absence of control numbers, and you can understand why these stamps have been so popular with collectors for many decades. It may be difficult for the uninitiated to distinguish an early Paris print from a later Athens print. One reason for the scarcity, and therefore high price, of the one lepton is that it was used to pay the newspaper rate. Many were therefore discarded. However, the two (and presumably the five) lepta was also used for newspapers, but perhaps many more survived since it was used less often. The 20 lepta was used for inland mail up to 15 grams, 40 lepta for up to 30 grams and 80 lepta for every additional 100 grams. If you think these stamps look like the first French issue - you're right. The frame is the same. But where the French stamps show an image of Ceres, the Greek show Hermes "messenger of the Gods". The stamp was designed by the Frenchman Albert Barre whose father, Jean Jacques Barre, was the chief engraver of the Paris mint. The elder Barre had engraved a French coin with the image of Ceres. 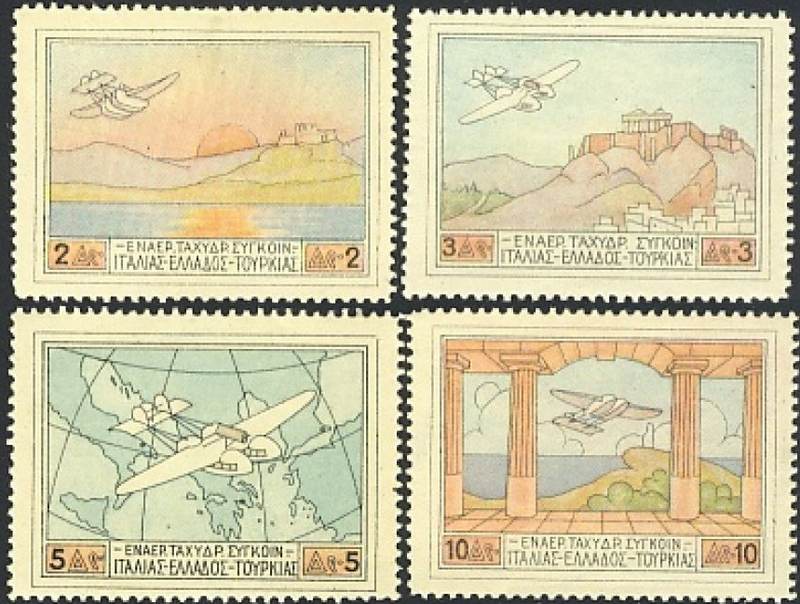 In 1926 Greece issued its first airmail stamps (Sc C1-C4) for the Italy - Greece - Turkey - Rhodes service. Remarkable by the standards of the time, this set remains one of the most attractive of all issued stamps, let alone amongst airmails.